The art of paper folding is known as origami. It's a great inexpensive craft to make with children because all you need is paper! This pattern is a good example of how you can take most traditional origami models further to make them unique. Add extra folds at the end or slightly adjust angles to produce a different head or ear shapes! The traditional origami dog face is usually made without the nose, tongue or lower jaw. If you had a paper that is white on one side, though, you could easily draw on the tongue and muzzle color! You just need one sheet of square paper for this. To start with, the suggested paper size is at least 15 by 15 cm. The more comfortable you get with origami, the smaller you can go. For other very simple origami models, check out the loopy origami paper plane diagram, easy origami card stand tutorial, or easy traditional origami turtle instructions. Start white side up. Place the paper in a diamond position. Fold the top corner down to the bottom. Fold the right corner over to the left. Fold one corner down, leaving a small gap at the top of the middle crease. Fold the other side down to match. You can now fold the bottom corner up and behind. 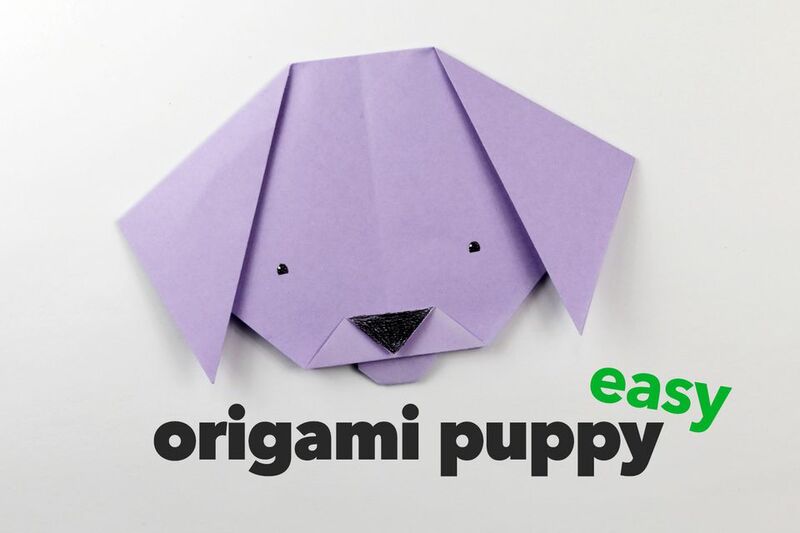 You can finish here for the simplest origami dog face! To make either the puppy's tongue or lower jaw, fold one layer of the bottom up and continue to the next step. Fold the flap back down again to meet the bottom of the head. Flip the model over to the other side. Fold the lower flap down, leaving a small gap. Fold the bottom corner up a tiny bit to round out the tongue and jaw. If this is to be the jaw, it's finished! Continue to the next step if you're making a tongue. Fold the right corner of the lower section down as shown. Unfold and use your finger to bring the flap out and over to the left. This line is where the fold will be. Doesn't matter if it doesn't look neat. If these steps are too tricky for you, simply use some scissors to snip the shape of the tongue.